Seven powerful African leaders have hailed Liberia's election as free and fair and urged anyone unhappy with the result to avoid resorting to violence. The leaders, including South Africa's Thabo Mbeki and Nigeria's Olusegun Obasanjo, praised voters and election officials for a "job well done". Ellen Johnson-Sirleaf is on course to become Liberia's next president. But her opponent, former football star George Weah, has demanded a re-run, complaining of vote-rigging. Hundreds of his supporters staged angry protests in the capital, Monrovia, on Friday after official results showed Ms Johnson-Sirleaf ahead. Mr Weah has urged them to remain calm. With almost all the votes from Thursday's run-off election counted, Ms Johnson-Sirleaf has an insurmountable lead. She is expected to be named president when official results are announced soon - making her the first woman to be elected president anywhere in Africa. The leaders of Nigeria, South Africa, Ghana, Senegal, Ethiopia and Algeria as well as the chairman of the African Union commission issued a statement during a meeting in Abuja on AU issues. They described the vote as "peaceful, transparent, free and fair," AFP news agency reported. Anyone who disagreed with the vote outcome should "use constitutional and legal means to address any grievances," they added. The Weah camp has made allegations of ballot tampering, intimidation and harassment during the vote. An investigation is under way. 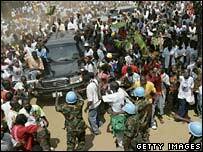 The UN Security Council has already urged Liberians to settle the dispute peacefully. International observers say the election was broadly free and fair. The West African regional group Ecowas has urged the losers to accept the result with dignity and grace. However, Mr Weah re-iterated his claims of fraud in an interview with the BBC. "As far as I am concerned there will be a re-run and I am going to pursue that," he said. Weah campaign officials filed a petition with the Supreme Court on Friday to halt vote counting. But the court rejected the appeal and referred them to the National Elections Commission. 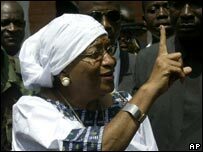 Ms Johnson-Sirleaf rejects claims of vote-rigging as absurd. She told the BBC she hoped Mr Weah would join her new government after "getting over his disappointment". The election was held after the 14-civil war ended two years ago.